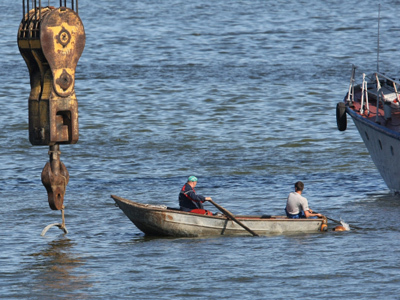 Bad weather may put on hold the raising of the river cruiser Bulgaria, which sank in the Volga River. Engineers have tilted the vessel on its keel, but if a storm begins, it would be unsafe to continue the operation according to schedule. The ship is to be lifted to the surface by two floating cranes and later tugged to a dock. The current plan is to have it floating on Wednesday. However the weather forecast says a storm is possible in the Russian republic of Tatarstan, where the Bulgaria sank. 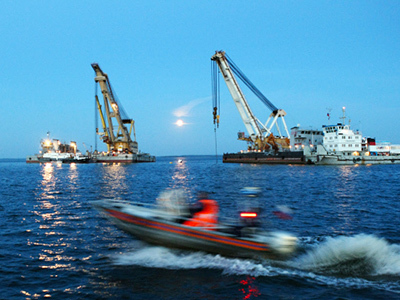 Two barges loaded with sand are on standby at the site of the operation. They will protect rescue ships from waves, if the need arises. The engineers had to put preparation for the lifting on hold earlier on Monday night, the Emergencies Ministry said. Working on the site is quite difficult even in calm weather, and rescuers do not want to take unnecessary risks. “The problem is that the water around the motor vessel is muddy, which greatly limits visibility. Even from a distance of a meter almost nothing can be seen,” spokesman for the operation command said. Other difficulties include the soft riverbed of the Volga River. Some divers’ reports said that in a matter of one week the hull of Bulgaria had gone a meter deep into the mud. The ship may also prove quite fragile from old age and in the worst-case scenario the cables from the cranes may cut through the vessel, experts say. The salvage operation was continued during the day on Tuesday. The Bulgaria has been rolled on its keel. Divers are now sealing its port side windows, which will allow the pumping of air into, and water out of, the hull. The buoyancy it will create is to help the cranes in lifting the vessel. The salvage operation is being conducted with haste to speed up investigation into the wreck. It involves some 800 people, 30 river boats, five barges and 15 hovercrafts. The government has allocated $5.3 million to fund the operation. 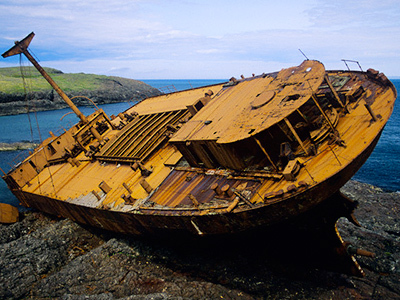 The Bulgaria sank on July 10 on its way to the republic’s capital Kazan. Only 79 people out of the 208 onboard survived. As of Tuesday, seven of them are still in hospitals. Four relatives of the victims also had to receive medical treatment, apparently due to the shock. Fifteen of the victims are still yet to be found.